The moment that Child of Eden, the follow-up to Sega's trippy musical shooter Rez, starts to look evolutionarily different from its predecessor is during the level known as "Beauty." It's a trip through a softly colored, garden-like alien world, full of bizarre abstract creatures. Child of Eden still plays just like Rez, however. It too is an on-rails shooter, with a reticule players control with their outstretched hand when playing the Kinect version (as I did last week). You'll target and lock onto things that look like butterflies, jellyfish and flowers—or how one might hallucinate all of those things—and unleash a series of shots to purify this world. It's a stark contrast from the cold, angular aesthetic of Rez, but full of the same visual energy, this time more organic. The new version of Child of Eden available at a recent Microsoft preview event had things we hadn't seen in previous builds, namely a new HUD that kept score, showed our life gauge and how many screen-clearing bombs—Euphoria attacks—we had. "Beauty" plays familiarly to the Rez fan. It's a flight through a blue-skied world, water rippling beneath the player. Sometimes you dip beneath the surface to see what lies beneath. You'll engage in boss fights with big creatures that are made of petals and tendrils. 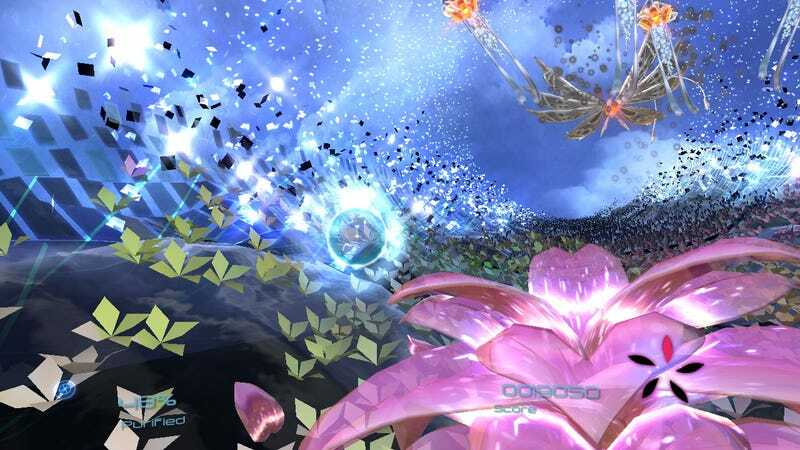 Child of Eden now plays better than it had before at Tokyo Game Show 2010, with Kinect controls showing less lag, making it easier to target and shoot objects and enemies on screen. Camera control was still something of an issue when playing with a Kinect-controlled reticule. It was easy to lose one's bearings while zipping through this abstract world. We also got a look at the game's collection mechanism. It appears that players will be able to collect creatures and objects from the game's levels ("Archives") and house them in something that resembles an in-game aquarium. How we'll unlock and access these collectibles, Q Entertainment reps wouldn't confirm. But they did confirm the existence of force feedback for Child of Eden, for up to four Xbox 360 controllers at once. The idea is that, even while playing the hands-free Kinect version, players can put controllers in their pockets (or devise some other method to hold them) to feel the vibration of the game's beat. We were told that Q Entertainment had even devised a special belt that held four Xbox 360 gamepads, but that the accessory is unlikely to ever be seen outside of the developer's studio. Child of Eden's "Beauty" level featured music from Tetsuya Mizuguchi produced musical group Genki Rockets, which generally has an airy, upbeat feel. The remix for the "Beauty" sounded uncharacteristically darker, sounding more like a Rez track than the level looked. But despite its different visual and aural style, Child of Eden is straight-up Rez gameplay, with its key innovation showing in the form of two different shot types: lock-on targeting and a rapid-fire auto attack. Ubisoft and Q are aiming for a summertime release for Child of Eden, which is also coming to the PlayStation 3.